Stevens Institute of Technology’s Ecohabit House placed fourth overall at the U.S. Department of Energy Solar Decathlon 2013. The team earned second place in the Architecture Contest and tied for first in Hot Water. 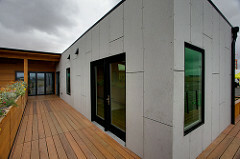 After Solar Decathlon 2013, Ecohabit was relocated to the California State University San Marcos campus. It currently serves as a veterans’ center for the nearly 900 student veterans, service members, and military dependents at the school. Additionally, science and technology students continue to monitor the ongoing performance of the house.